Did you know that for the second year in a row, Kentucky Kingdom is offering a special deal for 4-H members, families and extension staff in Tennessee? This year’s deal is valid from April through September, when the park closes. Be advised that some dates are not valid for this amazing member benefit. To view the park’s buyout dates, when it isn’t open to the public, please visit kentuckykingdom.com/experience/hours/. Ticket prices start at $29.95 (+ tax) and include two consecutive days at two parks with free soft drinks. 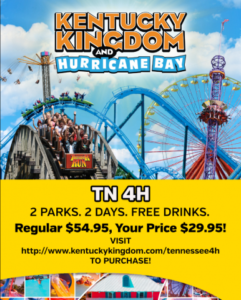 For more information about this year’s deal and where to order tickets, visit kentuckykingdom.com/partners/tennessee4h/ or contact Hannah Johnson, Regional Sales Manager at hjohnson@kentuckykingdom.com.